It's been a few weeks since I last participated in the Weekly Wrap-Up, and I can't possibly remember all that we've done lately. Fortunately, we take a lot of pictures and blog with some regularity. * Finished our co-op classes! Started mentally planning for next year's classes! * Had our last regular meeting of the year for both Cub Scouts and American Heritage Girls. The 7th-12th grade girls also finished a Bible study they've been doing for the year: One Girl Can Change the World. Awesome study, and it was a pleasure to be one of their facilitators for the year. 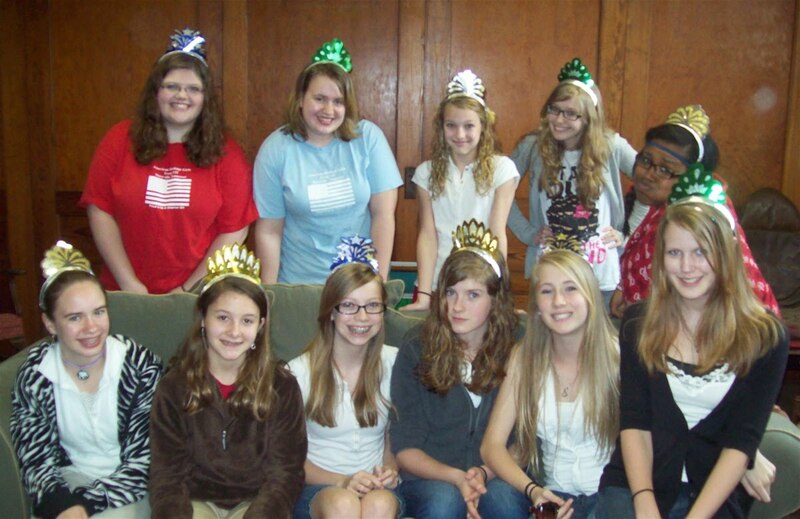 They are precious young women. This weekend my daughter is in Nashville with our youth group for a 1 By Youth community work day, cleaning up after last spring's flood, and my menfolk are at Boy Scout Camporee. I've been busy alternating between painting trim, cleaning the house, and raking debris up in our yard after our huge storm on Wednesday. Well, and blogging every now and then. What's been happening in your world? 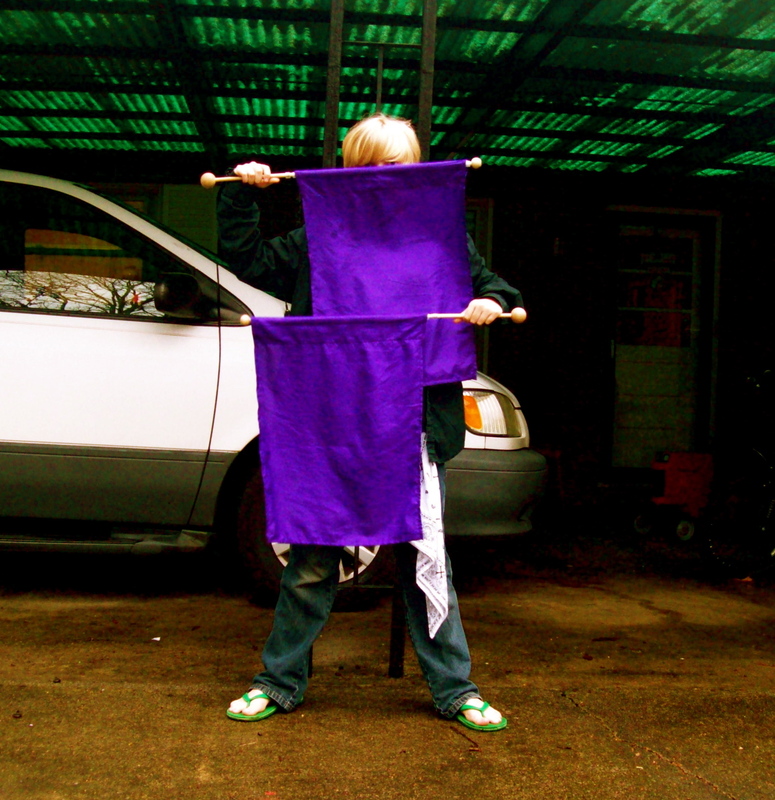 Link it up at the Weekly Wrap-Up at Weird, Unsocialized Homeschoolers! I first created a unit study about Titanic many years ago, when my oldest son was about 9 and his brother and sister just little ones. Eight or so years later, we revisited the Titanic, this time with my youngest son at age 10 (the oldest is now 18). Click here to see our original Titanic unit study. It's much longer and goes into more detail. We did an abbreviated version this time around, with our last two now in 4th and 8th grades. 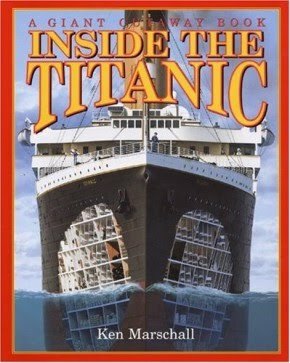 There are absolutely dozens of what look to be excellent books written about the Titanic. Here is a list of 225 of them on amazon.com. Below are the ones that we read. * Polar: The Titanic Bear. This is the true story--told from the POV of a stuffed bear--of one family's experience on the Titanic. This is such a wonderful story, with so many topics for discussion. Note especially the lifestyle of the rich and famous in the early 1900s. Activity: Write a story from the POV of a favorite toy. * The Heroine of the Titanic. This is a fun story about Molly Brown. * On Board the Titanic by Shelley Tanaka. This is a really excellent, comprehensive book about the disaster, told through the eyes of Jack Thayer, first class passenger, and Harold Bride, assistant telegraph operator. * Titanicat by Marty Crisp. A true story about a ship cat and the boy she saved. * The First and Final Voyage by Stephanie Peters. This is a short, graphic (as in comic book/text style) novel that my 10-year-old absolutely loved to read. I'm going to be looking for more historical novels by this publisher. * Titanic by Martin Jenkins. * Ghost Liners: Exploring the World's Greatest Lost Ships by Robert Ballard. Great book to finish off the unit. This explores not just the Titanic, but also other great ships that have been lost. * National Geographic's Titanic: How It Really Sank. This was the best movie that we've seen about the Titanic disaster. Extremely engaging and informative. The kids loved it. * Eyewitness History: The Sinking of the Titanic. Read about the sinking from the perspective of a governess on board. * Titanic: Hidden Expedition. This is a fun online game to find a treasure on Titanic. * Encyclopedia Titanica. Loaded with information and stories. * Discovery Channel's Last Mystery of the Titanic. Take a virtual dive, quizzes, hear video stories, and more. * Escape the Titanic. My 10-year-old loved this game, although the premise of it is disturbing: As a third class passenger, the player is directed to "Escape from the sinking Titanic. Collect enough money to bribe the crew and get to the upper deck." Sigh. • Family history: Make a family tree, going back as far as you wish. Be sure to write the surnames of your ancestors. Talk about whatever family history you know. Where did your ancestors come from originally? Point out the different countries on a map. Trace the route they may have taken over. Afterwards, search the passenger/crew list for names that belong to your child's family tree. The Encyclopedia Titanica has a fantastic list of all passengers and crew. We found our surname and a couple other names on our family tree. 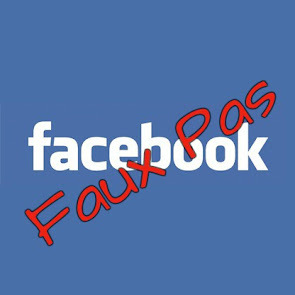 (You may like to find names of friends if you can't find any of your own family's names.) Talk about the names you've found. What class was the passenger in (first, second, steerage)? Where may they have been going? How might their lives have been changed after the disaster (particularly if one family member was lost and others survived). * Class structure. Studying the Titanic provides a great avenue to discuss class structure. Ask your child if we still have a class structure today in the United States. He or she will most likely say "no." We launched into a long discussion about our own class system, ranging from homeless people to tycoons. We also briefly discussed the caste system of India. 1. Have your child state why he believes heavy ships can float and what he thinks will happen with this experiment. 2. Cut two 12-inch squares from aluminum foil. 3. Wrap one of the metal squares around 10 paper clips and squeeze the foil into a tight ball. 4. Fold the four edges of the second aluminum square up to make a small one square pan. 5. Place 10 paper clips in the metal pan. 6. Set the metal pan on the water's surface in the bucket. 7. Place the metal ball on the water's surface. 8. Record what happens when in steps 6 and 7. The metal pan should float and the ball should sink. Have your child write an explanation of why this happened. 9. Discuss buoyancy and how it allows huge ships like the Titanic to float. • Discuss the issue of lifeboats and why they were such a factor in the number of people who died on the Titanic. Ask questions about what/who determined who got into the lifeboats. • Figure out how many lifeboats there were on the ship and how many people each could hold. • How many people would be without a lifeboat? • How many lifeboats should there have been? * Construct the Titanic! My 10-year-old wonderful model of the ship with black construction paper. He used about 8 sheets to make it about 3 feet long by taping the paper together. He cut out all the details around the outside of the ship and used a white gel pen, crayon, or chalk to make the windows, etc. Looks really great! A great book to read along with this is Inside the Titanic. * Take an icy plunge! Fill a large mixing bowl with a lot of ice and add some cold water. When the water gets really, really cold, have your kids try keeping their hands in as long as possible. Discuss hypothermia. 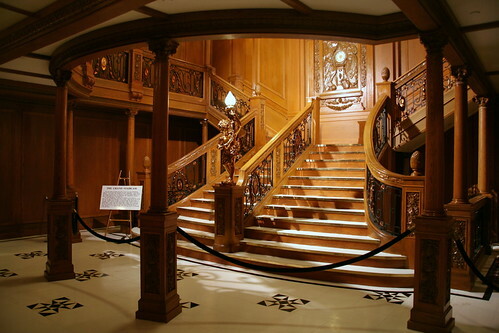 * Visit the Titanic Museum! I know this is not an option for everyone, but if you are going on vacation to either Pigeon Forge/Gatlinburg, TN or Branson, MO, you have a fantastic opportunity to be immersed in all things Titanic. 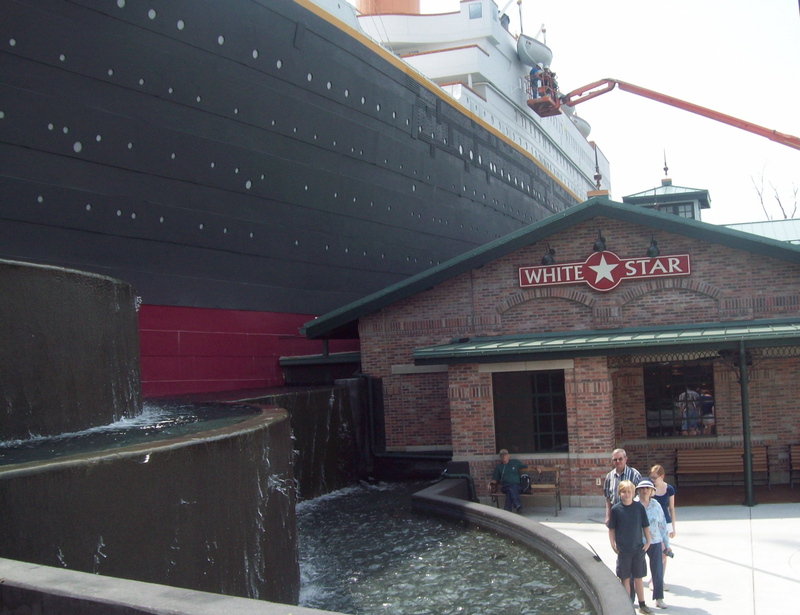 Here is my review of the Titanic Museum in Pigeon Forge. 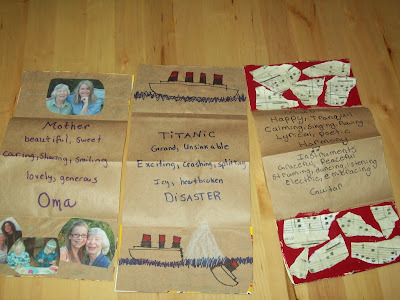 Titanic Lapbook by Hands of a Child. This looks fantastic! If you want to really delve into great detail, you might want to consider buying this! Titanic Coloring Book from Dover. Dear America: Voyage on the Great Titanic and the Magic Treehouse Tonight on the Titanic and its nonfiction companion guide are books I would have liked my kids to read. My 13-year-old daughter, however, does not particularly like the Dear America books. She finds the diary style of the series to be repetitive and too formulaic. We loved the Magic Treehouse books a couple of years ago, but at 10, my son has lost interest in them. 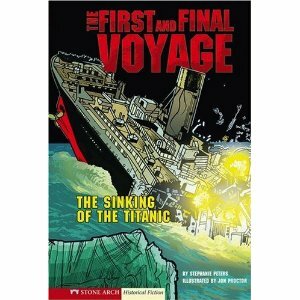 BUT if your kids enjoy these books, I think they could be a huge asset to studying Titanic. The Titanic disaster still captivates people nearly 100 years later. Kids of all ages are fascinated by the ship, the people, and their stories. Whether you take a few days or a few weeks, I highly recommend taking some time to introduce your kids to this amazing slice of history. Hyperbole and a Half: Alot Is Better Than You at Everything. I love this post so much. It makes me laugh in a ridiculous way every time I read it! Ideas for Getting Over Writer's Block. Some great stuff here! I edited this down to 19 kid-applicable ideas and forwarded it to my creative writing class. 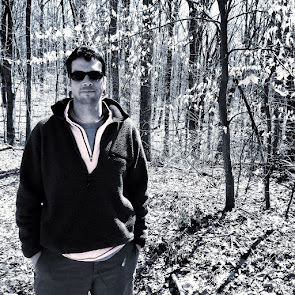 Diamante poem on Making Books Blog. We're definitely trying this during the last week of National Poetry Month! Poets House: I soooo need to go here. Admittedly I'm moderate about modesty (I have no problem with spaghetti straps and even *gasp* bikinis), but I absolutely love this article: Parents' Don't dress Your girls Like Tramps. Reminded me of snippets in Celia Rivenbark's Stop Dressing Your Six-Year-Old Like a Skank. Sweden Bans Homeschooling: What Would Pippi Longstocking Say? Blogger Pat Farenga writes, "A modern-day Pippi would have to flee to a country with more educational and personal freedom than Sweden in order to have her adventures now." World History Resources at Homeschool Mo: Fantastic list with lots of kid-friendly links. Army guys and their top secret missions. New pup, happy to be out of the animal shelter. 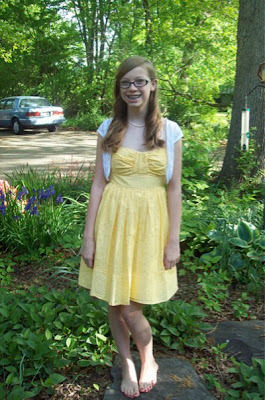 Beautiful girl in her Easter dress. 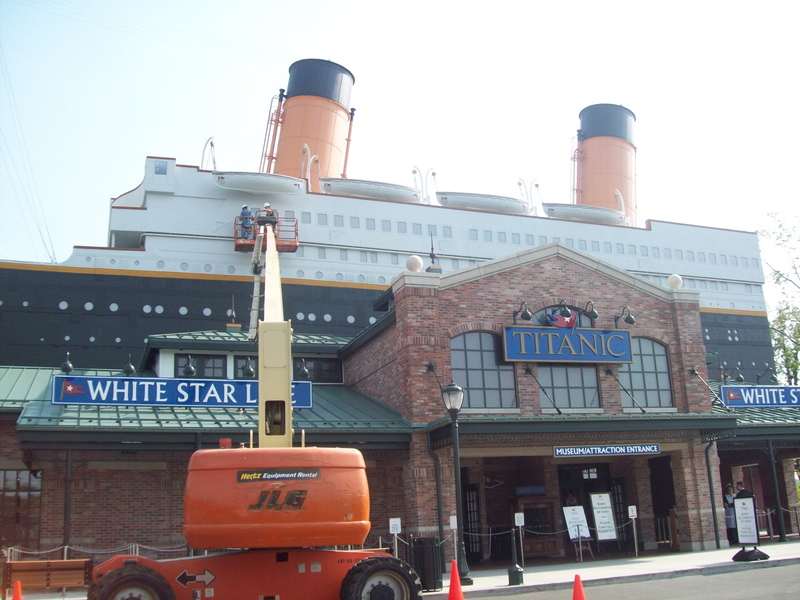 I've been wanting to go to the Titanic Museum in Pigeon Forge ever since it opened last spring, and we finally had the opportunity last week. It was absolutely fantastic! My parents were able to go with us, which was wonderful! They've also been drooling about the museum for the past year. The kids and I had just spent a couple of weeks studying all about Titanic, so we were very familiar with what we were about to see. Here is our Titanic Unit Study. I highly recommend familiarizing yourself and your kids with the story of the disaster before visiting. The museum would be interesting on its own, but I think it was tremendously enhanced because this was like all of our reading and DVD watching come to life, in a way. We also visited the Education Guide that is available on the museum's website and carried the scavenger hunt with us to do at the museum. If you do nothing else in preparation for a visit, at least do this! The museum itself is the story of the life of Titanic—conceptualization, building, outfitting, sailing, sinking, and unburying—and of the people whose lives were forever changed by it. We did the new audio tour (additional cost), which I highly recommend. This gadget gives you special stories about the various displays that you see and has both an adult version and a kid's version. My 13-year-old and I loved this. My 10-year-old listened to about half of it and then found more entertaining things to do. My parents (in their 80s) did not benefit from it. They both wear hearing aids and found that they would have to remove their hearing aids in order to hear it. That was too much trouble for them. Each room is filled with myriad photographs, artifacts, letters, reproductions, and fantastic explanations of what you're looking at. Some rooms have actors/crew who explain what you're seeing and give you extra stories. Probably my only complaint about the museum is that I couldn't understand two of the main crewmen. They did not articulate well, and as my father says, "They were mumbling." He says this about everyone, but in this case, I really couldn't catch most of what the guys were saying. Fortunately, I had that handy audio tour! Duncan, age 10, rushed through the museum rather rapidly until he go to the hands-on areas (i.e., the disaster itself). He spent a long time touching the iceberg replica and seeing how long he could keep his hand in the 28-degree water. He also loved the room that shows how far the deck tilted and challenges you to keep your balance. Here he could also send an SOS signal and practice tying knots. This was definitely the highlight of the museum for him! While he rushed ahead with my parents, Laurel and I took our time seeing as much as we could through the third and second class areas. I got to learn quite a bit about my passenger, who was married to the only black man on board. Because they were an interracial couple, they had to sail second class, even though they could easily afford a first-class ticket. Their whole story was fascinating. One of my favorite parts of the museum was the Father Browne Gallery, which showcases dozens of the only photographs taken during the Titanic's passage from Southampton to Ireland. Father Browne did not make the entire voyage (he got off in Ireland), and these photos were found some 75 years later after his death. Amazing! Eventually we went up the Grand Stairway to the first-class exhibit. The first room you see there is the stateroom made famous in the movie Titanic. The luxury enjoyed by the rich was truly amazing, especially after coming up from the 3rd and 2nd class rooms. So many fun things to see there: china, Mrs. Astor's actual life jacket, a tattered deck chair, lots of letters. And much, much more. After making our way through the first-class rooms, we finally found Duncan at the scene of the disaster (no surprise there). We visited the bridge, where the actor playing Captain Smith mumbled. Fortunately, we had plenty to read and listen to there and in the other disaster rooms. I loved the checker and cribbage boards made from the actual wood of the Titanic. Eventually we came to the end, where we could find our passengers' names on the wall to see whether ours had survived or not. This was sobering, especially to see how many men lost their lives. We ended up in the gift shop, where of course each child bought a Polar, the Titanic Bear. We loved that book. I give this museum a big two-thumbs up. 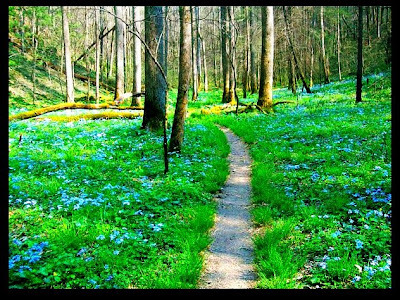 If you are making a trip to Gatlinburg, don't miss it! Again, I recommend studying about Titanic before going. Also, be sure to go when the crowds are smaller. I've heard that it gets very stuffy with big crowds, and I can imagine that would be true. Avoid summer and spring breaks (generally March), if possible. Next April, by the way, is the 100th anniversary of the disaster. What a great year to go! My grandmother was a packrat. I’m grateful she saved letters written by my great-great-great grandfather during the Civil War and that she saved a sampler handed down through a dozen generations to me. But those stacks of magazines and drawers filled with miscellaneous utensils? When we moved her out of her home, she was living in just one room of house. The rest was filled literally to the ceiling with junk. We’re all far from that extreme, right? But what about those boxes of clothes we’re saving for someone, the worksheets from our daughter’s first-grade year, and the puzzles with missing pieces? Do you ever feel cluttered inside because of clutter in your home? 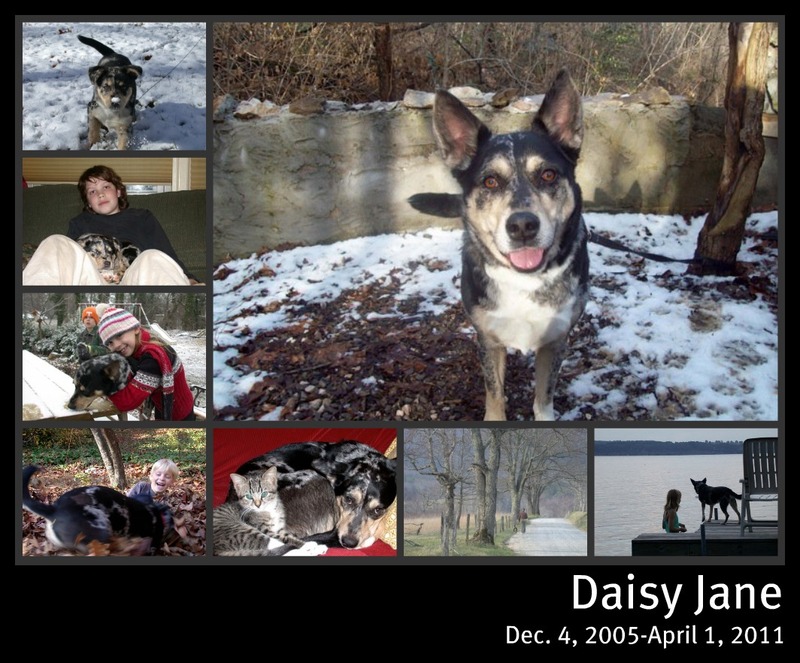 We miss our sweet Daisy girl so much. We knew we'd get another dog eventually, thinking sometime in the fall would be good. 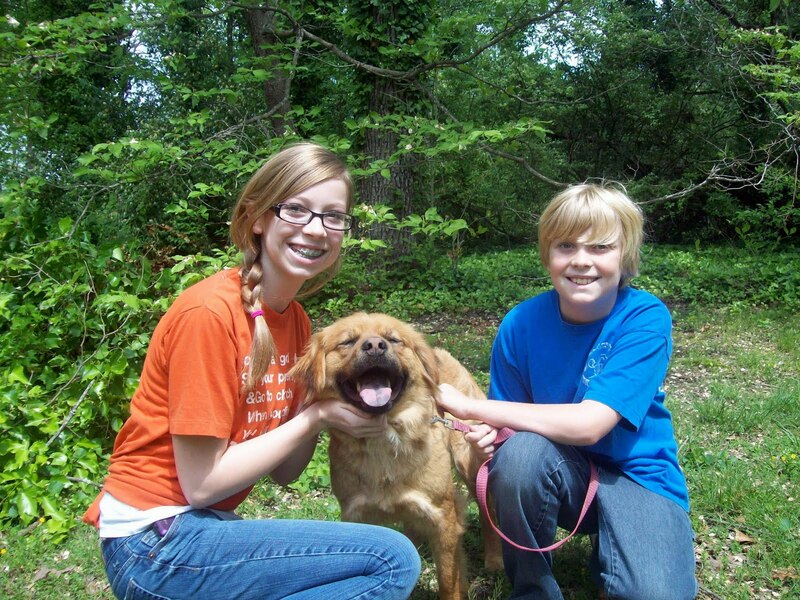 But the local animal shelter was over capacity and having an emergency adoption event. We've been looking at their Facebook page these past couple of weeks and had our eyes on Autumn, who is part chow and part Golden Retriever. 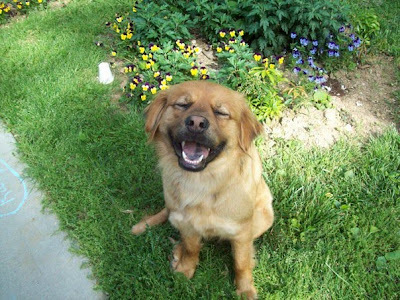 "Good with kids, playful but calm, sits peacefully while the other dogs bark." 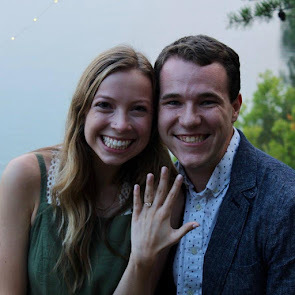 We couldn't imagine she'd last long enough for us to make up our minds to take the plunge. So we took it. The kids and I went to the adoption event today to check her out and knew we should bring her home as soon as we saw her in real life. She's met her whole family and lots of friends already, and hasn't barked yet. What a sweetie! We decided to keep her shelter name; Autumn fits her perfectly. Duncan has said over and over today, "I am so happy. I'm just so happy." Welcome to the Carnival of Homeschooling! I'm glad you're visiting here at SmallWorld at Home. Let me introduce myself for those who are new here. I'm finishing up my 11th year of homeschooling, currently with a 4th grade son and an 8th grade daughter. 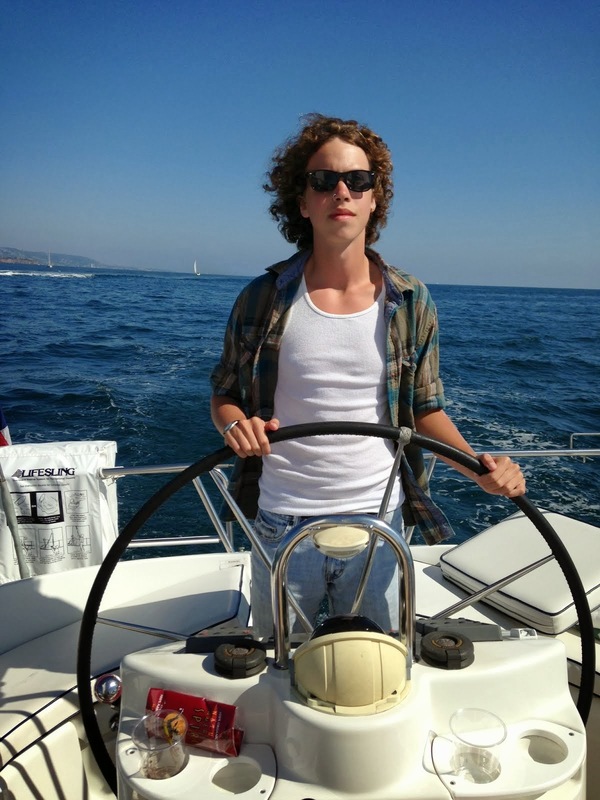 Our oldest son is finishing his freshman year in college. (Want to know how that's going? Check out my Burying the Big Yellow Bus.) And yes, he was homeschooled all the way through high school. But enough about me; you're here for the Carnival! 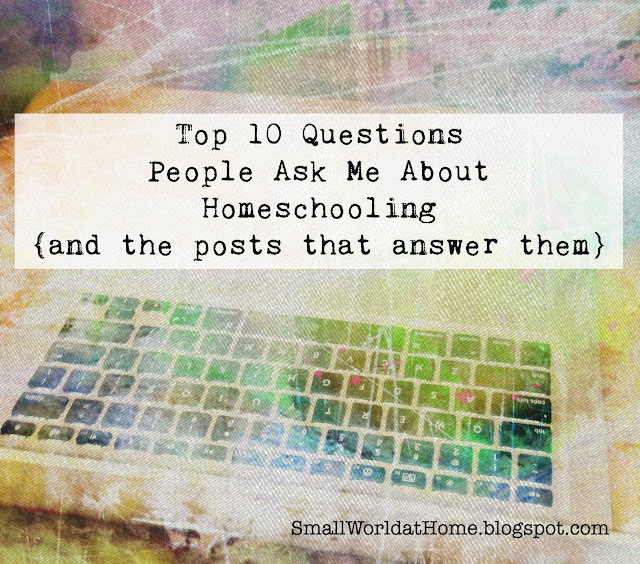 We have a little something for everyone on this homeschooling journey with this carnival, from fun hands-on activities to thought-provoking posts about homeschooling issues. Read on, and come back and visit! 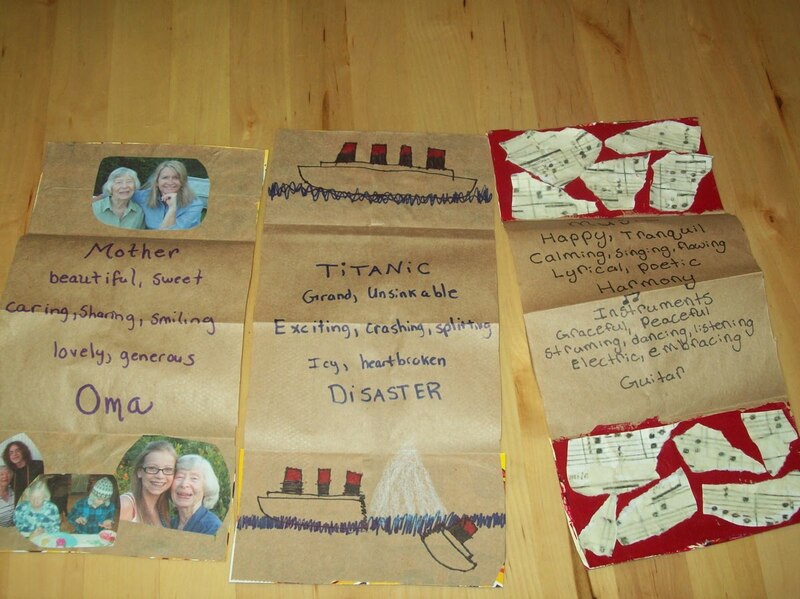 Participating in family projects can be such a wonderful way to learn! AnnieKate shares ideas for Frugal Seed Starting, Homeschool Style posted at Tea Time with Annie Kate. Heather relates an incredibly fun and interactive day with Desert Photo Scavenger Hunt Hike posted at Marine Corps Nomads. Alicia Arnold presents Encouraging a Sense of Play Builds Creativity Skills for Life posted at Daily Creativity. Learn what happens when a homeschooling mom decides to take her oldest son on a business trip to Israel over spring break. 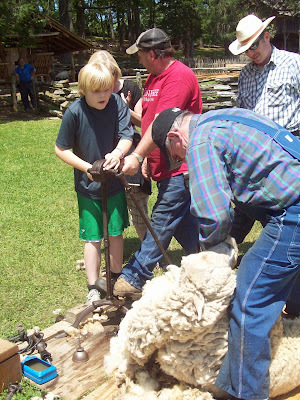 This is hands-on homeschooling at its best! Alexandra shares Homeschooling in Another Country posted at Destinations, Dreams and Dogs. Here's a fun, hands-on math game, described by Dena Wood of pjsallday.com: Marble Math ~ Beginning Addition and Subtraction. A woman after my own heart, Amy @ Hope Is the Word is celebrating National Poetry Month with Cousins of Clouds: Elephant Poems by Tracie Vaughn Zimmer posted at Hope Is the Word. Check out these terrific resources to live and learn about International Year of Chemistry, provided by Becky Rupp on Resources, Resources: Fizz, Bubble, Bang, and Ooze posted at PARENT AT THE HELM. How can you tailor learning styles for right brainers and left brainers? Katie presents Right Brain, Right Brain, Left Brain, Left posted at Katie's Homeschool Cottage. Mary writes that "at our house crying or being bored with something doesn't mean it isn't worthwhile or not working." Great thoughts on How do you know a curriculum isn't working for your child? posted at Winecup Christian Academy. Misty provides a few ideas that helped her homeschool family get a handle on gaming, television, and media time with How to Get your Kids to do Their School – Part 2 – Media Time posted at Homeschool Bytes. Mrs. White reminisces about her own childhood and suggest ways of Creating a 1950's- like Childhood posted at The Legacy of Home. Lisa Nehring presents 7 Habits of Highly Effective Homeschoolers posted at Golden Grasses. In Classics posted at We Keep Choosing Us, Tori lists some of the books her family is reading, with comments on why these books and others of this sort are of value. As Read Aloud Dad says, "History can be horrible. And the further back in time you go, the more horrible it becomes in some ways!" Check out Horrible Histories: Bloodcurdling Box of Books posted at Read Aloud Dad. Kaye Swain of SandwichINK says she's a big believer in fun with reading, phonics and other educational activities for grandparents and grandchildren, and puts reading out loud to them at the top of her to-do list. Educational Grandkid Fun With Reading, Phonics, and Even Cool LEGO Architecture Sets! provides some of her favorite ways to get books and other reading resources. Kathi Weiss discusses Reading, reading, Reading - Blogs - Parent Community and Forum posted at Parent Community and Forum. At Evaluation Station Blog! Carleen Galiardo shares thoughts on her brief journey into the world of secular homeschooling in With Tears and Prayer. When homeschooling parents divorce, their decision often affects other homeschooling families. 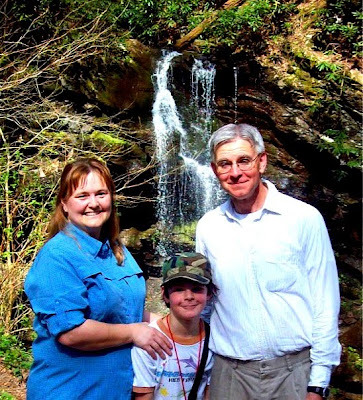 Barbara Frank discusses Divorce Often Threatens Homeschooling Freedoms at Barbara Frank Online. 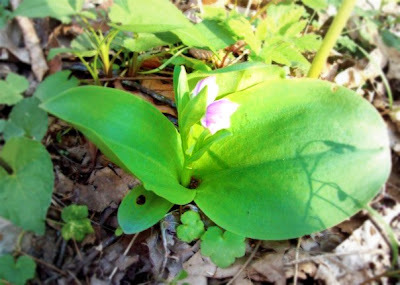 Susan Ryan of Corn and Oil presents Signs of Spring in Illinois. And finally, Henry Cate, Carnival Director, wonders if a recent bill for a distorted view of history will push more parents to homeschool on Why Homeschool. That's it for this week's Carnival! 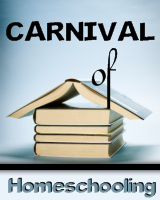 Submit your blog article to the next edition of carnival of homeschooling using our carnival submission form. Past posts and future hosts can be found on our blog carnival index page. Next week's Carnival will be hosted at Corn and Oil. Don't miss it! Such a great post for moms with little ones: Help! My 5-year-old won't "do" school! Fantastic post about why we parents are encouraging apathetic faith in our kids: Your Kid's an All-Star? Wow! Someday He'll Be Average Like the Rest of Us. Ultimate list of printable math manipulatives and games at Jimmie's Collage. Just WOW! They are pretty much the nicest people you could ever meet, as well as perfect hiking companions. Our boys had to have gone at least twice the mileage the rest of us did, with all their side trips and bouncing. Thanks to Dr. Hibiscus, my botanist husband, for that fantastic list! For me, though, the absolute highlight of the hike was the magical world of the sinks, covered in a carpet of phlox. No photos I can take can do it justice. It is simply magical—a place for fairies, for laying down one's head and dreaming sweet dreams. Imagine this little bit above magnified over and over: that's the beauty of White Oaks Sinks in April. Linked up on Outdoor Wednesday, Parenting by Dummies, and 5 Minutes for Mom. This afternoon my father and I planted flowers while my mother napped. My father dug the holes and I squatted before each one, laying in a phlox plant, covering it with dirt, watering it. I had a vision, a sudden grip of fear, as he dug the third hole: what if my father should suddenly fall? What if he were to drop his shovel, grasp his chest, and gasp? Those are thoughts I have to shake off, blink away, dismantle. Today is my mother's 84th birthday. While she slept and after we planted a dozen phlox for her, my father and I sat together on the patio. "I've lost the gift I bought your mother," he said to me. "I hid it somewhere so she wouldn't find it. I've looked everywhere, and I just don't know where I put it." I wish I could help him. I wish he'd told me where he put it when he did, but chances are I would have forgotten his hiding place, as well. I put my hand on top of his. We watched a mockingbird alight on the fence. The colors were too rich for a photograph, and although I thought about taking a picture of the pair of jeans and seven white socks hanging on the clothes line, I memorized it all instead. 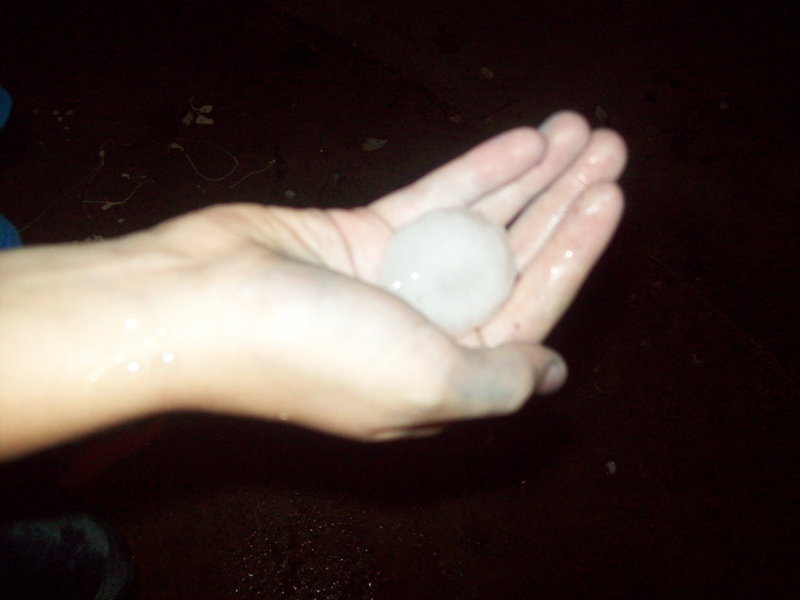 My father's hand. The pink and white dogwoods and a grass so green I had to stop looking, and couldn't look away. The yellow pansies and my father's blue shorts. The smell of leather and the red handle of his pruners. I can't help it. I memorize this moment because I am too aware that someday they will end, these warm spring days planting flowers with my father while my mother naps. The grass is greener than ever and my mother's eyes are blue. The phlox are periwinkle and purple. On the clothesline my father's jeans flap in the wind. 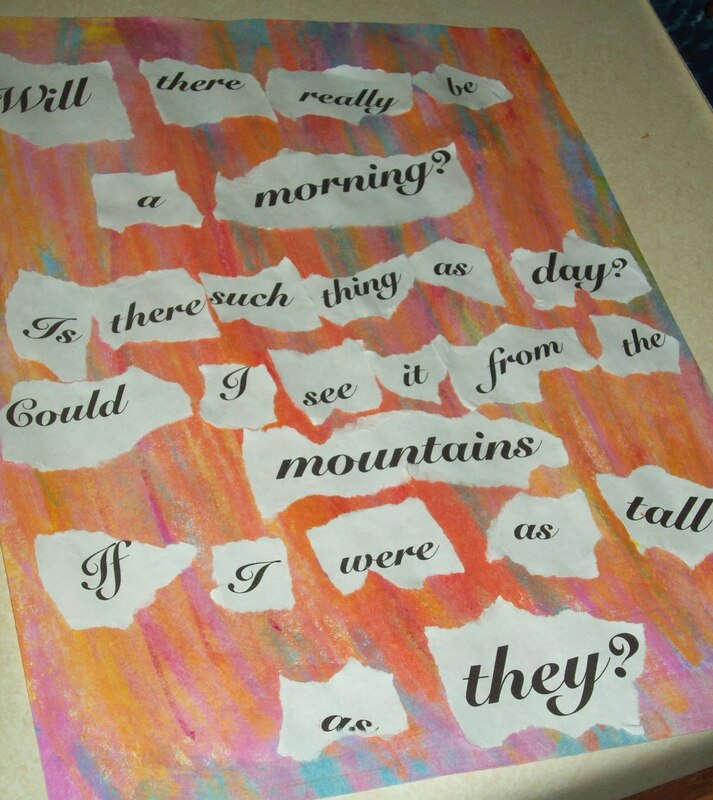 I was inspired by this post at Making Books Blog to make that type of poetry collage, but kids do have minds of their own. We started with a basic theme of "spring" and started plowing through poetry books. We all read aloud whatever poems appealed to us, and then we picked a poem each to make into a picture. Laurel chose this Shel Silverstein poem, "The Oak and the Rose." I chose "Violets" by Valerie Worth. 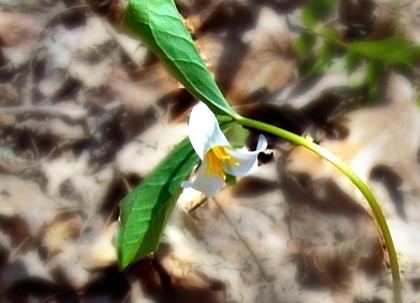 It was Laurel's idea to add real violets. Duncan chose "The Man in the Onion Bed" by John Ciardi. He added a special scratch-and-sniff feature with wild onions from the yard. 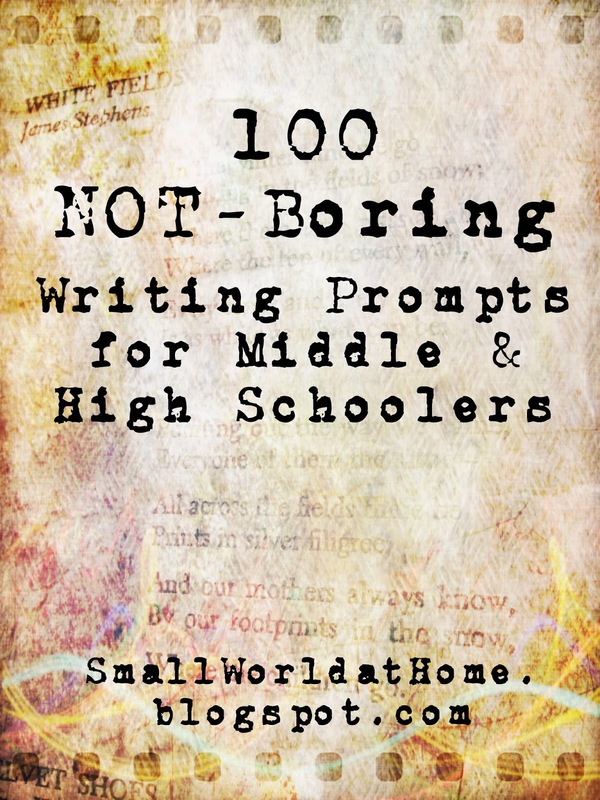 If you'd like to try some creative writing with your kids and don't know where to start, take a look at my WordSmithery. I recommend starting from the beginning, but here is a fun activity for spring flowers poetry. I am starting to get that "finishing up" feeling, even though we still have another 6 or 7 weeks left of this school year. 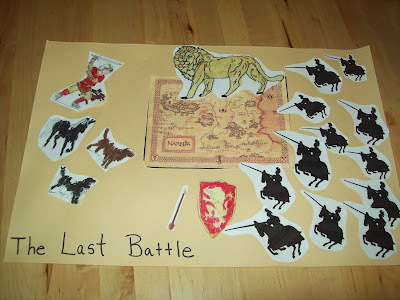 We finished up our Chronicles of Narnia study last week. 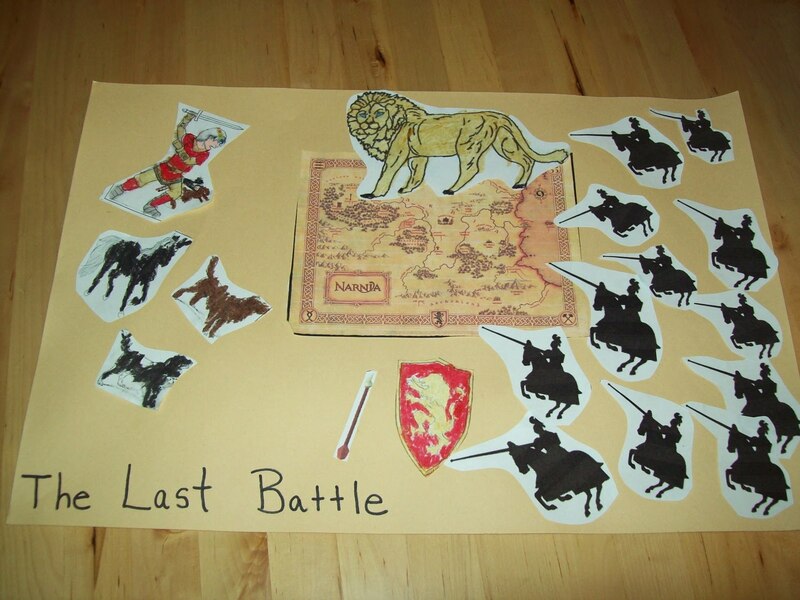 Duncan did a short presentation for his book club on The Last Battle, and then we spent a few days reviewing and discussing the books. I felt really sad upon finishing, thinking that I probably won't read these books again until I have grandkids of the right age! The kids had their spring production in their performing arts co-op. Laurel was taking both drama and international dance, and Duncan was doing flags. Here he is with his flags on dress rehearsal day. The kids both had a great year at the co-op and look forward to returning next year. And the end of that means that we now have our Tuesdays totally clear! We spent our first free Tuesday afternoon keeping those creative juices flowing by reading and illustrating poetry in recognition of National Poetry Month. I'll write more about what we did in a separate post later. Being a poet, I'm especially happy that my kids love exploring poetry, and I have some more awesome activities coming up for them next week. 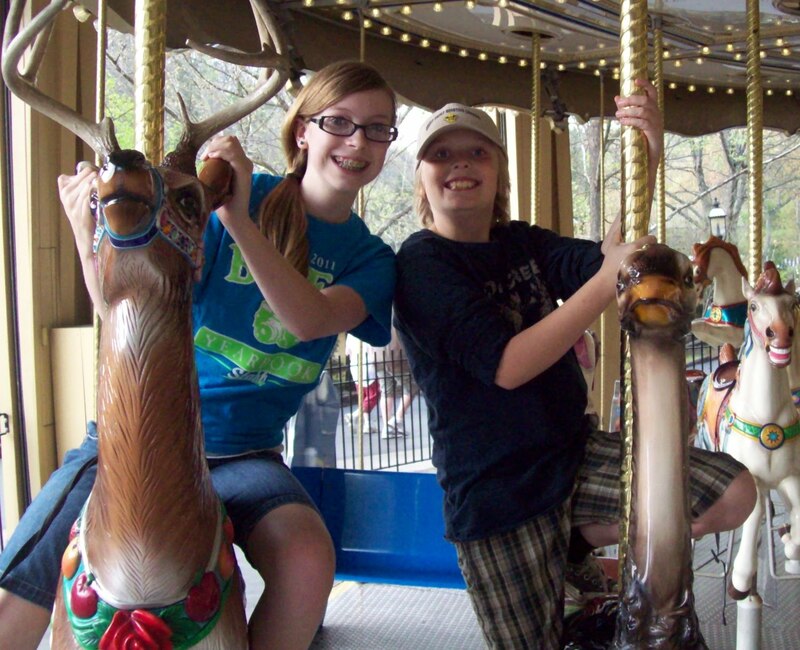 We took a day this week to head over to Dollywood with my parents. The Festival of Nations is going on right now there, so we took in a few shows and then a few rides. The day was absolutely perfect. We got season passes for the first time in a few years, so we are looking forward to going back several more times. We just have one more day of enrichment classes on Monday, and then we'll have yet another day totally at home. I am always amazed at how quickly we wrap things up at the end of the year when all of our outside activities come to a halt. This past week, having finished our Narnia studies, we decided to do a two-week unit study on the Titanic. I created a Titanic unit study years ago when Jesse was in about 4th grade, and this seems to be the perfect opportunity to revisit it. We read a couple of books to get started. Next week we'll watch the Imax movie and do more activities. But what we have now that we didn't have so many years ago when we did this originally is the Titanic Museum so close to us! We are going to visit the museum in a couple of weeks, and I am really looking forward to it! I love this time of year, not necessarily because school is almost over but because we've shaken off those winter blues and seem to have clearer heads and greater motivation. There is something especially exciting and enriching about discussing literature in a group setting. Homeschooling families tend to devour books at home, but we don’t always discuss them chapter by chapter. We often assess our students’ comprehension with a few questions or some chatting about the book. Analyzing books to death often takes the pleasure out of reading. For the past couple of years I’ve been teaching a literature circle class at our co-op. I perhaps shouldn’t call our class a “literature circle” because it doesn’t fall into the typical literature circle format of student led/teacher observer. (This page gives a good overview of a typical literature circle.) For various reasons—including physical space, time, and meeting limitations—I tweaked the concept so that we basically have a discussion-based class, teacher-facilitated, but with lots of projects and student input. We're are adjusting to a family without our pup. It's been a weekend of quiet mourning. We have had a crowded few days since our Daisy died, with company, rehearsals, and a big production with the kids' performing arts co-op. We've kept busy. We haven't been in our "regular" life. But still, there are those moments. When we drop a piece of chicken on the floor or have a bite of leftover hamburger. When Duncan and his friend wrestle. When someone comes to the door. No pup to eat our leftovers or bark a warning. I complained a lot about our dog. I didn't like cleaning up poop in the mornings. I didn't like the jolt of a sharp bark on an otherwise peaceful afternoon. I didn't like how she was always underfoot. I wouldn't have considered myself a "dog person" on an average day. But oh my goodness. I never imagined that we would lose our pup in such a way. I thought vaguely about how someday the kids would all be in college and it would be just Randy and me and the dog. How they would come home to their old pup, who would wag her tail maniacally. Sigh. This is one of those hard things. But we are slowly getting back on solid footing. We have to. You know what's been nice? The absolute outpouring of condolences from friends and family. Everyone knows. Everyone has been there. And there is great comfort in community, once again. Yesterday was a hard, hard day. Our sweet pup got hit by a car. Her back was broken, and she had to be put to sleep. Our hearts are broken today. She wasn't a perfect dog. She barked until my nerves were shattered. She shed great puffs of fur. She pooped on the floor now and then. She sometimes got into the bathroom trash, especially if there was an empty tube of toothpaste in it. She sometimes ran away, just because everything smelled so good and interesting outside. But she was the best dog for our family. She loved us with every fiber of her being. She protected us. She let the kids dress her up and roll on her. She had the prettiest eyes, and she was happiest when we were all in a room together. Sigh. 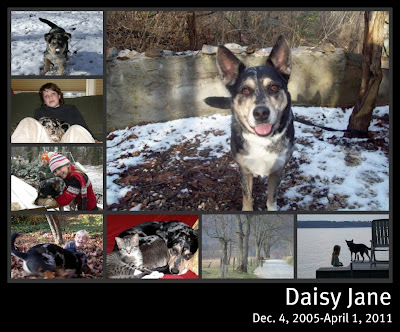 This pup—she was part of our family. It's so much easier when cats just wander away.